One of the aspects of baseball that is the hardest to quantify and evaluate is fielding ability. Most events in baseball, such as hitting events, are discrete which makes them easy to tabulate and model probabilistically. The central difficulty with fielding is that we are trying to evaluate players on a continuous playing surface where we must take into account not just whether a successful play was made, but whether a successful play was possible. The much-maligned error statistic is a subjective attempt at discretising this phenomenon: players are assigned an error if the official scorer deems that their unsuccessful play should have been successful. However, tabulating errors isn't a good measure of ability without a corresponding measure that credits a player for making a play that most players wouldn't have. Recent techniques such as Ultimate Zone Rating or the Plus-Minus system from The Fielding Bible are based on the tabulation of both positive and negative fielding events. These statistics are more accurate measures of fielding ability. 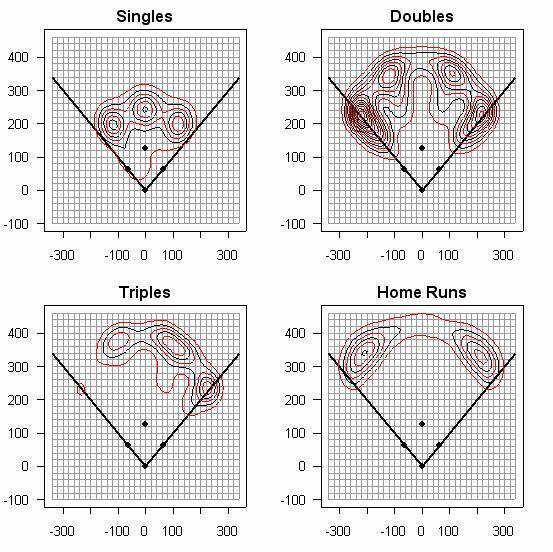 However, despite being obvious improvements on previous methods, both of these approaches are still based on dividing the baseball field into discrete zones and vectors, and tabulating events within each zone. Ideally, the baseball field could be treated as the continuous playing surface that it actually is, instead of a set of zones or vectors. Instead of tabulating fielding events within discrete zones, we fit continuous probability distributions to each fielder based on their past fielding events. Our BIS data does not provide a key piece of information for each g-bip: the location of each fielder before the ball was hit. We estimate the starting location for each fielder as the (x,y) location in the field where each position has the highest overall probability of making a successful play. For each grounder, we then convert the bip coordinates into the angle at which the grounder was hit off of the bat. An angle of 0 corresponds to the 3rd base line while an angle of 90 corresponds to the 1st base line. We model the probability of a successful play on a grounder as a smooth function of the angle between fielder location and the BIP path. We model different functions for each velocity category, and also allow a different function for fielders moving to the left or the right. These models are calculated using the data from all infielders, and so represent the ability of an aggregate fielder at each position. In the figure below, we show the probability model at each position for successful fielding of grounders with an intermediate velocity. We see that each position has a distinct probability model. Note that pitchers seem to have a much larger range than the other infield positions only because they are much closer to home plate and therefore do not have to travel as much distance to cover the same range of angles from home plate. We calculate the same probability models using only the data for each individual fielder and allowing different parameters for each player. Since we have different models for each individual player, we can quantify the difference between players by comparing their individual probabilities of making an out relative to the aggregate probability of making an out. As an example, the figure below illustrates the comparison on grounders between the aggregate model for the SS position and the individual models for the best and worst shortstops. For each possible angle, we can calculate the difference D between particular fielder's probability of success and the aggregate probability of success. 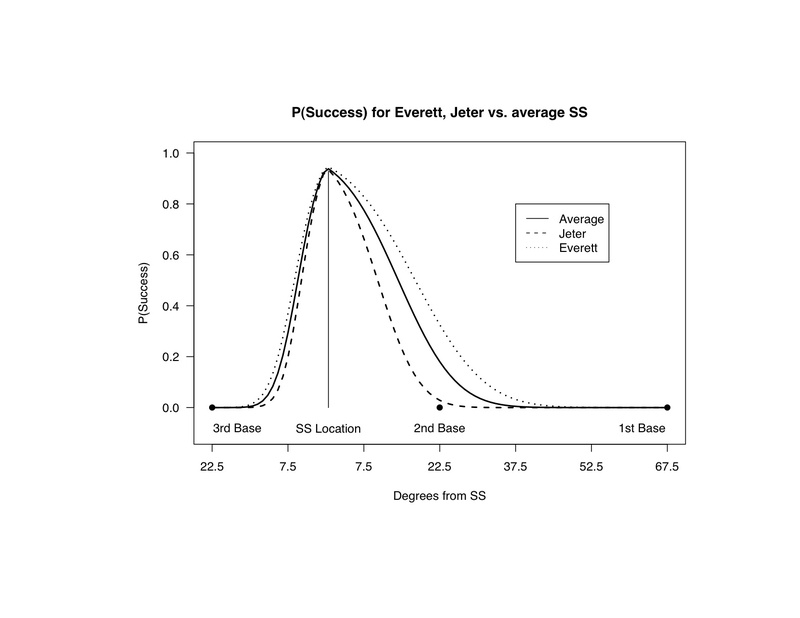 A rough measure of fielder ability is the sum over all possible distances of the difference (individual player - aggregate) in probability of not making a successful play. This sum is carried out by simple numerical integration. However, since not all distances occur with equal frequency, our SAFE measures are actually calculated as a frequency-weighted sum, so that more frequent distances or angles are more important. 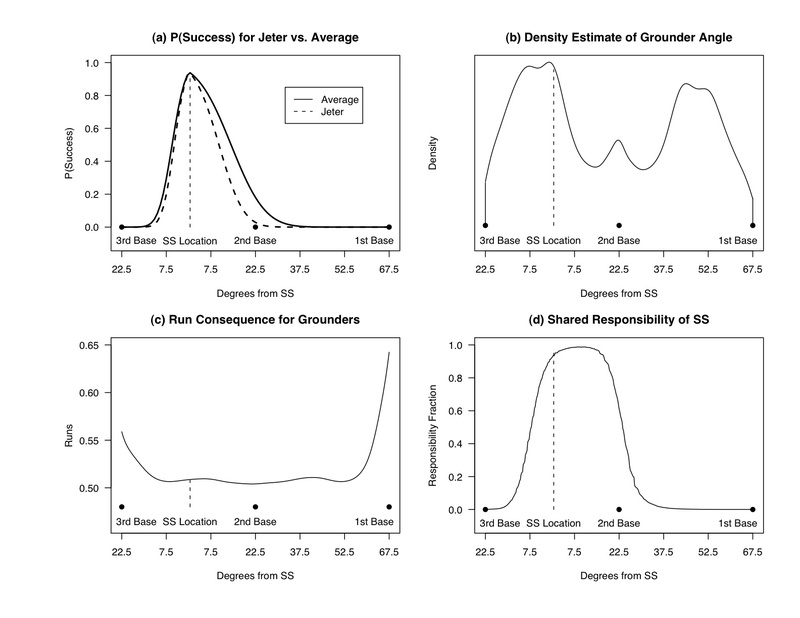 In addition, our sum is also weighted by the average run consequence of each angle, which allows us to take into account the different consequences of grounders to different areas eg. a missed grounder down the first base line leads to more bases than a missed grounder to the shortstop. The figure below shows the different weights that go into our aggregation. Thus, for an individual player, their SAFE statistic can be interpreted as their expected runs cost/saved relative to the average fielder. A good fielder will have a large positive SAFE, which means a high number of runs saved, whereas a bad fielder will have a large negative SAFE, which means a high number of runs cost. Our BIS data does not provide a key piece of information for each a-bip: the location of each fielder before the ball was hit. 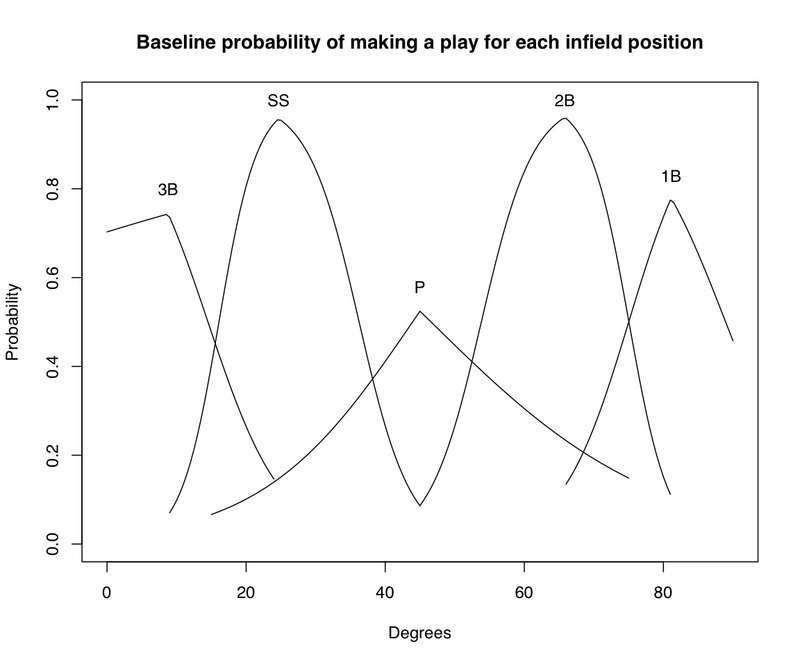 We estimate the starting location for each fielder as the (x,y) location in the field where each position has the highest overall probability of making a successful play. We model the probability of a successful play on a a-bip as a smooth function of the distance between the fielder starting location and the a-bip coordinates. We model different functions for each velocity category, and also allow a different function for fielders moving to the left or the right. These models are calculated using the data from all infielders, and so represent the ability of an aggregate fielder at each position. My student James Piette wrote his Ph.D. thesis on "Evaluating Fielding Ability in Baseball Players Over Time". Instead of treating each player-season as independent, he combines information over time within a player. Three new models are compared: a constant-over-time model, a moving average age model and an autoregressive age model. You can download a copy of his thesis here. The SAFE estimate columns vary between models, as the first two models are season-specific (i.e. columns refer to season) and the last two models are age-specific (i.e. columns refer to age). There are also, additional pairs of columns; for the constant-over-time model, columns related to the player-specific estimates are included and for the autoregressive age model, columns related to the initial state estimates are included. In general, the SAFE estimate columns can be read like the following: mean refers to posterior mean, int1 refers to lower bound on posterior 95% interval and int2 refer to the upper bound.